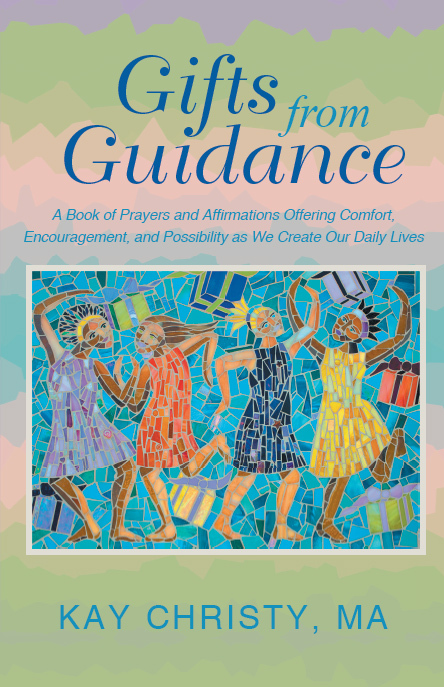 Gifts from Guidance is an anthology of prayers and affirmations written over a 10-year period. It was written using an intuitive writing process that invokes messages through the author’s highest self brought by her spirit guides and guardian angels. The messages within are gifts from the author’s unique guidance system. She offers them to you with the wish they will bring you comfort, encouragement and inspiration toward the world of possibilities your life has to offer. They are meant to…..
Kay’s personalized prayers have helped me through some of the most difficult times of my life. Last year I was suffering from serious health challenges and required emergency surgery. My daughter reached out to Kay and asked for a personalized prayer for me. It’s hard to put in words how much that prayer spoke to me. While I was recovering from surgery, I began each and every day by reading that prayer. I also read it before each doctor’s appointment, as I sat in the waiting room terrified about what the doctor might say. The prayer brought me comfort, and strength, and most of all, it brought me hope. When my niece found out she was expecting, I knew a personalized prayer from Kay would be the perfect gift! I presented the prayer to her at the baby shower and she loved it. She framed it and hung it in the nursery. It really was the perfect gift. My son suffers from asthma and we have had some terrifying episodes where he hasn’t been able to breathe. When he was just four months old, I found him in his crib, gray and unresponsive. I had never been so afraid in all of my life. Kay wrote a personalized prayer for me that calmed my nerves and restored my spirit every time I read it. When I was my most anxious, I would recite the prayer over and over, almost like a mantra, and before long, my heart would stop racing and I would feel my breathing becoming normal again. My son is now 10 and I still carry Kay’s prayer with me in my wallet. The page is so worn and the words hardly visible, but I will carry it with me always. Complete the sign-up form to receive more information about Kay’s projects and Gifts from Guidance! that knows only of wholeness and love and faith. the solutions appear with brilliant light and clarity. staff and crowns and robes for peace.